I have fallen in love. 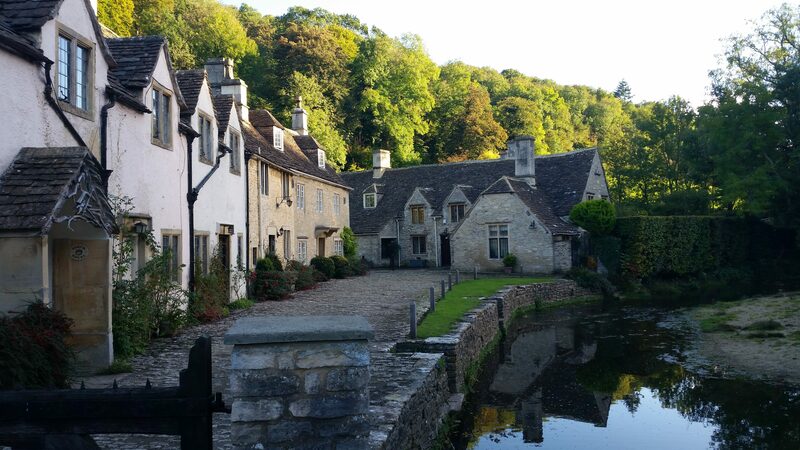 Your rolling hills, your fields full of sheep and cows and horses, your cobbled streets, green grass, even the rain and wind (if only because the rain is the reason for the green-ness of the grass). When I first saw you, it was like coming home, like being reunited with an old friend. I doubted my parents when they said I’d start to remember things, but now I know they were right; it’s surprising how much comes back, even fourteen years later. I have seen Edinburgh, Glasgow, the Borders, and everything between Edinburgh and Skye. I have sung ‘Loch Lomond’ on the bonnie banks themselves, I have posed for cheesy photos by the Three Sisters of Glen Coe, I have fangirled over Eilean Donan Castle and other filming locations, and I have appreciated the beauty of Edinburgh as the seasons changed. Having lived in Edinburgh for six months and having come back to the Borders every few years to see my dad’s family, I’ve always felt like Scotland was a part of me. But now I feel it more than ever; the cold air and surprisingly brisk wind have gotten under my fingernails and seeped all the way into my heart. 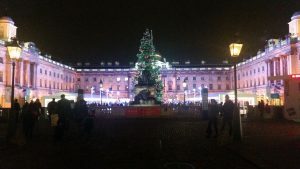 I had a lot of doubts about feeling at home in a city I hadn’t properly visited in fourteen years and about making friends and taking advantage of opportunities as a non-first year North American exchange student. I didn’t think I’d fit in, and now I can’t believe I had so many concerns. I pushed myself outside my comfort zone and told myself to seize the day; the fact that my time here always had an expiry date certainly helped with that, but I also believe that I got really lucky with the people I’ve met and the opportunities I’ve had. 1: December 2015 – I started my year off right with an amazing 20th birthday (thanks to my lovely family plus Noemi and Emily!). 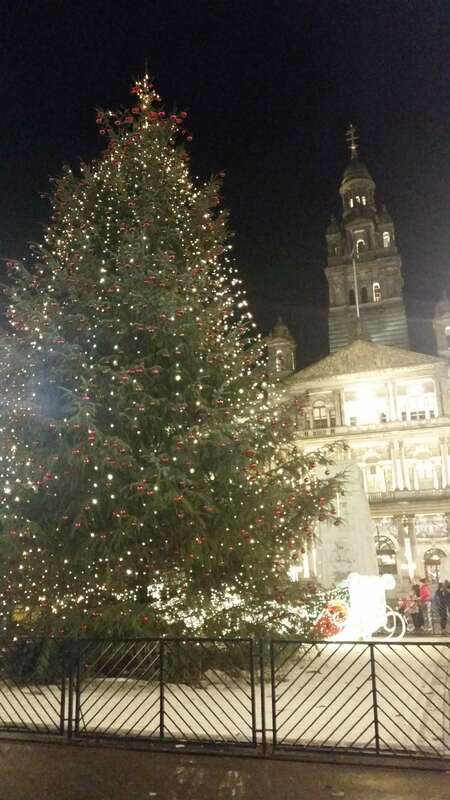 2: December 2015 – I had another amazing Christmas with my extended family. They never fail to make me laugh so hard I cry, and I’m sure this year will be no different. 3: January 2016 – I was accepted to study abroad at the University of Edinburgh (my top choice, and almost my university for my entire undergraduate degree). Cue the celebration and anticipation! 4: February 2016 – Noemi and I went on our first ‘cute vacation’: a spa retreat … we ate, got pampered, ate, hot tubbed, ate, pretended to do readings, and ate. 5: March 2016 – I went to the Sunshine Coast over Easter weekend for a staff retreat with my wonderful co-workers, facilitated by my awesome boss. Can’t wait to get back to working with them! 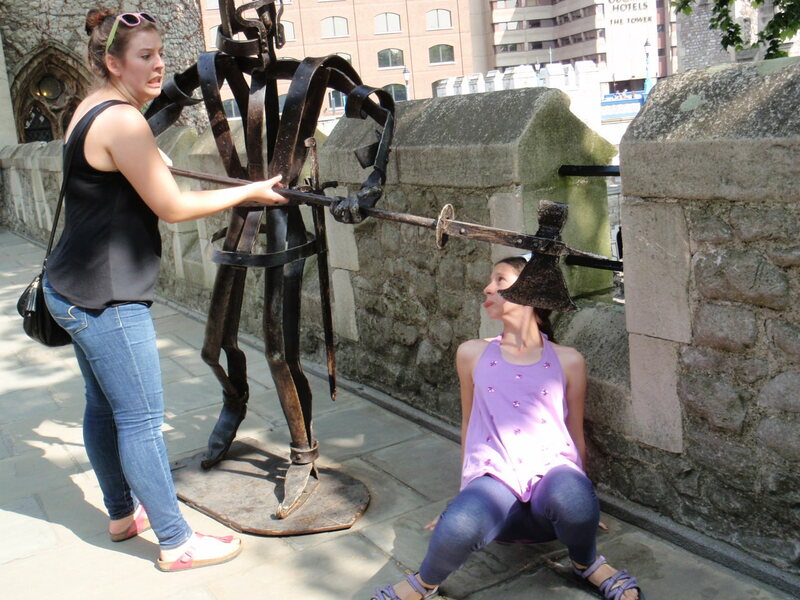 6: April 2016 – Noemi and I went on ‘cute vacation’ #2, this time we changed it up by eating fudge, writing papers, eating pasta, buying books like the true English majors we are, drinking slurpees, going to a museum, and (over)eating cheesy potatoes. 7: April 2016 – I finished my third year of university, felt weird that time passes so quickly, then reminded myself that ‘luckily’ I’m doing a fifth year, so I have an extra eight months to stress and multi-task! 8: May 2016 – I moved home to live with my family again over the summer – not #hoemi, but definitely a welcome change after my exhaustion. 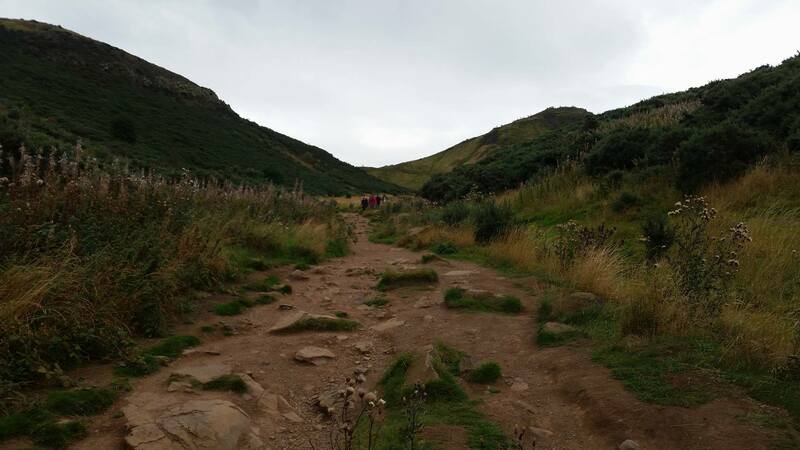 9: June 2016 – I finalized acceptance details for Edinburgh and finally started properly telling people. I had no idea then that it would be so amazing!! 10: July 2016 – I biked the seawall and took in the sunshine after a couple of days ‘unplugging’ and camping with my mum and Rosalie. 11: July 2016 – I spent some much-needed quality time with Rosalie after barely seeing her since last summer. Still my #1 girl, despite all our bike adventure disasters. 12: August 2016 – I was a counsellor at the VPL Writing and Book camp (again) and remembered why I’ve always loved it so much! The written word is a tool that everyone should appreciate! 13: August 2016 – I went to Holidaze and stayed with several of my Brownies in a cabin full of girls who insisted I sing them to sleep every night (so sweet). 14: September 2016 – My co-patrol-Guider Sam and I were accepted to take a patrol of Pathfinders to provincial Girl Guide camp SOAR in Smithers this coming summer! 15: September 2016 – I began my amazing exchange journey and realized quickly that I didn’t want it to end this soon. 16: October 2016 – I cooked my first full Canadian Thanksgiving meal and fed a handful of good friends. 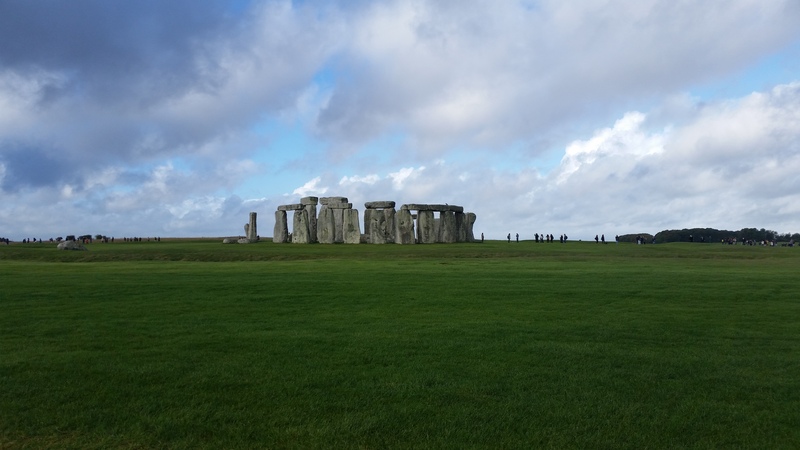 Also this month: travelled to Bath, Stonehenge, the Cotswolds, Skye, and Hawick. 17: November 2016 – I travelled to Paris and London and turned in my first University of Edinburgh paper! 18: November 2016 – My a cappella showcase went off without a hitch and I didn’t even cry on stage. The following week, I sang a solo at the Female Voice choir Christmas concert! 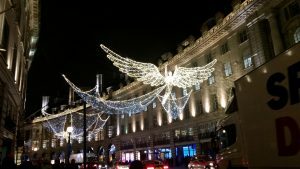 19: December 2016 – I got into the holiday spirit, despite being buried in work. I went to visit my dad’s side of the family one more time for an early birthday celebration that reminded me of the power of family. 20: December 2016 – I finished my last exam on the morning of my 21st birthday, complete with a freshly broken refrigerator and an end-of-exam fire alarm. Here’s to my 20th year being amazing and my 21st (hopefully) being even better. I’m really terrible at goodbyes, so I’m trying to break down my thoughts a little bit as I prepare to head home after three and a half months on exchange. I wouldn’t even be here without the hand-holding, help, and support of so many people I’m lucky to have in my life. These people deserve a massive “thank you,” which is particularly appropriate now as it happens to be the holiday season. If any of you are reading this post, know that I love you and I wouldn’t be where I am today without you in my life. My mum – she’s been my #1 fan for 21 years, and without her love, support, and confidence in my abilities, I’d be nowhere in life. I hope I can be even half as good a mum to my kids as she’s been to me; I admire her tremendously. My sister – she may communicate her love mainly through bad-angle Snapchat selfies, and she may be more than six years younger than me, but the girl is wise beyond her years and I really admire so much about her. Every day, I feel lucky and proud to be her big sister, and every day I think of another thing to annoy her with when I get back home. She truly is my best friend. 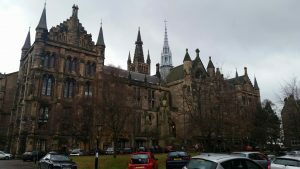 My dad – the original University of Edinburgh student of the family; he has always been supportive of my desire to come here and always wants to know how my courses are going. I hope I’ve made him proud by not only doing my exchange here, but now desperately wanting to come back to do a postgraduate degree. My entire extended family in Scotland – they picked me up from the airport, they housed me, they fed me, they texted to check in, they’ve had me to stay twice more, lent me towels and pillows, and celebrated my birthday early. They are here to remind me of my lifelong connection to this country that’s become a second home. 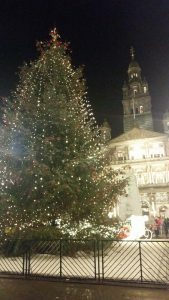 My entire extended family in Canada (and elsewhere) – without the promise of a traditionally untraditional family Christmas, leaving Edinburgh would be a lot harder. However, since I love Christmas really a lot, and I love my wacky family even more, I’m feeling suddenly homesick and excited for a belated birthday and a Bake Off-themed Christmas dinner, plus stockings full of funny, worthless treasures. My flatmates here in Edinburgh (including our honourary flatmates) – Flat 3(05), Tribe Iglesias etc., etc. – I love these girls ever so much, and I know that this isn’t the last time we’ll see each other. When you’ve seen each other first thing in the morning, last thing at night, exhausted, drunk, stressed, excited, hangry, bloated, and everything in between, it’s hard not to be friends for life. My Vancouver roommate – she knows I love her because I keep tagging her in stupid memes on Facebook, but seriously, this girl was my emotional support system for eight months, and just because we’re not currently cohabitating doesn’t mean I don’t still think of her as my honourary sister. 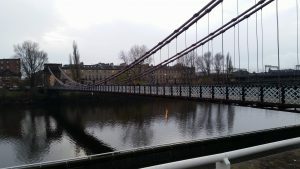 My Brownie co-Guiders in Edinburgh – they made me feel welcome straight away, and I really think this is a testament to the power of Guiding. In 145 countries, I could find a unit and feel at home, but I’ll definitely miss working with this team and these girls! My Brownie co-Guiders in Vancouver – I’ve missed them, it’s been great to hear from them, and I look forward to returning to them. I am forever grateful that they were willing to take on extra work while I was gone! My Vancouver friends – anyone who has reached out to me, know that it is appreciated. If you’ve listened to my rants and various emotional breakdowns, you are a peach. I don’t take it for granted. Noteorious – my acafamily, just a group of dorks who enjoy making music with their mouths. It’s been a pleasure to work with them and I am so excited to hear them continue to improve via the Internet. I almost didn’t audition because I knew how competitive it would be, and I was a little apprehensive when I went to a pub crawl having never met them before, but I had amazing luck. Everyone in the UoE Female Voice Choir – singing with these ladies was amazing; before this, I wasn’t a great lover of treble-only choirs, but the sheer joy of this group really bleeds into their singing. They are destined for great things! Anyone else who’s been a part of my journey, from the Go Global team at UBC, to the Ubyssey editors who published my monthly pieces, to the faculty at both UBC and UoE, thank you. To every barista who’s made me a coffee and every flight attendant who’s brought me a bland ‘special diet’ meal, to every person who’s smiled at me on the street or asked what my name was, thank you. On Friday I went on my second-to-last trip of my exchange journey – a day trip to Glasgow with a friend from my residence and a friend-of-a-friend who was visiting from Granada, where she’s on exchange. The three of us made pretty good travel companions, although we didn’t end up needing the nearly 12 hours we gave ourselves in a city whose centre is pretty compact. 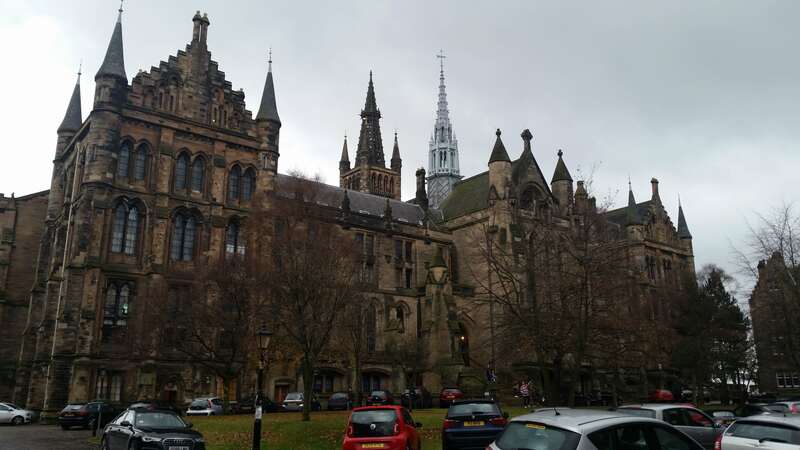 We started our day by taking the subway to the University of Glasgow campus. 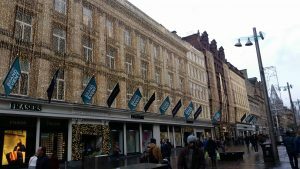 When I applied to go on exchange (through Go Global), Glasgow was my second choice, after Edinburgh. 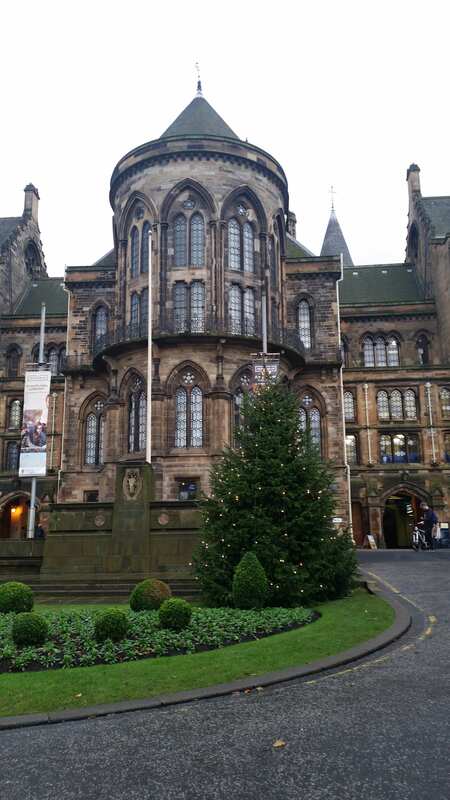 Having now been to the campus, I can see the appeal—it’s a historic school, like the University of Edinburgh, and the old buildings are gorgeous—but I am glad I ended up where I did. 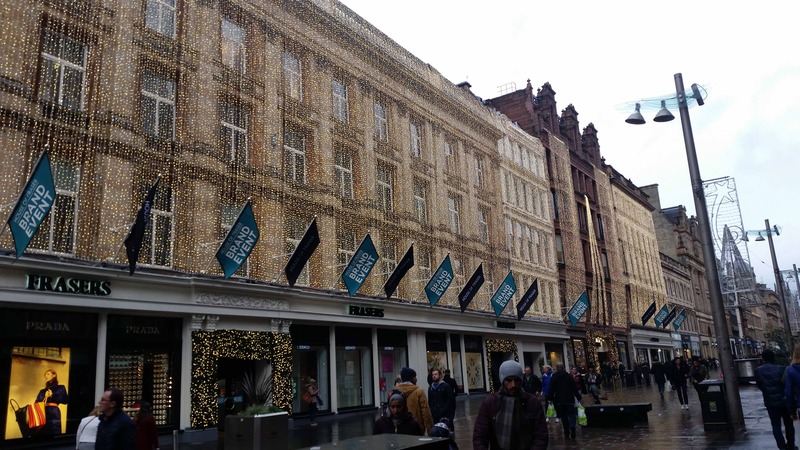 The weather was grey, but not rainy – so a lucky day by Scottish standards. The subway system in Glasgow, by the way, is very minimal; it’s a loop that goes around the city centre with an ‘inner’ and ‘outer’ line that go different directions around the loop. 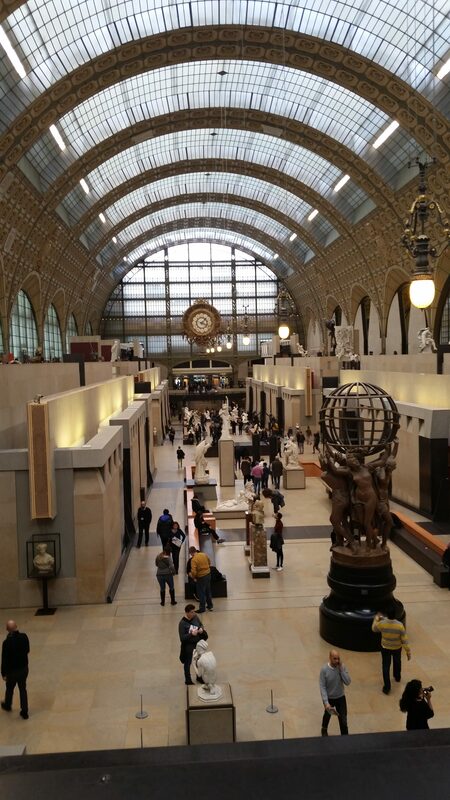 A quick Google search tells me that it’s just been modernized, and it is definitely very clean and organized, particularly compared to the systems in Paris and London (although much less expansive). After pretending to be University of Glasgow students for a little while, we went back to the city centre and, because we are cheesy Christmas-loving tourists, went to look at the Christmas floor at Frasers, decked out (like Harrods) in lights – I have to say that I miss the colourful lights and weird house decorations that seem to be more typical in North America. 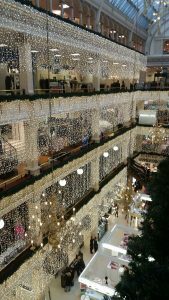 Here, it’s all white lights on stores, and the occasional house window décor, but nothing like the massive yard displays of inflatable Santas, nativity scenes, and sleighs with reindeer we get at home! 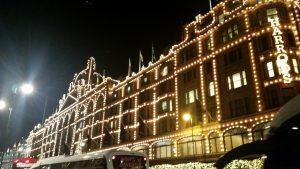 The inside was really magical and Christmassy, and while I didn’t end up buying anything here, it made for a good photo-op (and we later ended up at Debenhams, where I did actually buy some Christmas presents, although the interior wasn’t quite as nicely decorated). We decided we had to go take a couple of pictures of the river Clyde, which runs through the middle of Glasgow – one of the most striking things about the city was the juxtaposition of clean, new, well-kept buildings next to older, dirtier ones covered in graffiti. For instance, on the road that runs along the north bank of the river, there’s a beautiful church next to big boxy factory-like buildings and empty lots … and the suspension bridge that crosses the river is really cool, but the buildings on the other side look a bit unkempt. 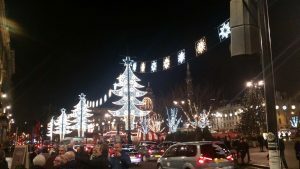 The Christmas market is behind all the tree-shaped lights – kind of difficult to see, but it was the bigger of the two in the city, although not as big as the massive one in Edinburgh or the one in Paris that goes down most of the Champs-Élysées. Given that I’m buried in exam studying (‘revision’ here), it feels unfathomable that I’m leaving Edinburgh in only 12 days. However, as a Christmas lover, I can safely say that I am excited for ten days to relax, recharge, and spend some time with my family before I have to start classes again on January 3rd … thanks, UBC. Next up: going down to visit my Scottish relatives one last time, plus two exams and two papers (‘essays’), and somehow, inexplicably, turning 21. Last weekend I went on my final major trip of the semester – essentially 36 hours in London. I did a crazy thing and flew there at 7am after a night out, so I didn’t sleep at all until that night. Then we took the overnight Megabus back, so another sleepless night made for a tricky day on Monday! Overall, it was a whirlwind experience, but definitely well worth it. 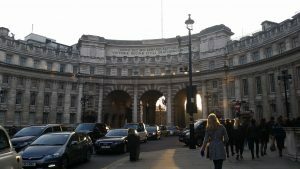 I went with one of my flatmates and three other North American friends of ours, and we got perfect weather yet again! 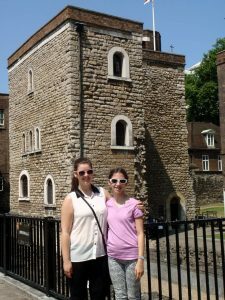 I should mention that I have been to London once before, with my lovely family in the summer of 2013 (just before I started at UBC) – we did a bunch of tourist-y stuff, so between the two trips I feel like I’ve seen a lot of the big sights. Of course, if I had a couple of weeks, there are more things I’d love to do, but we packed a lot into 36 hours! 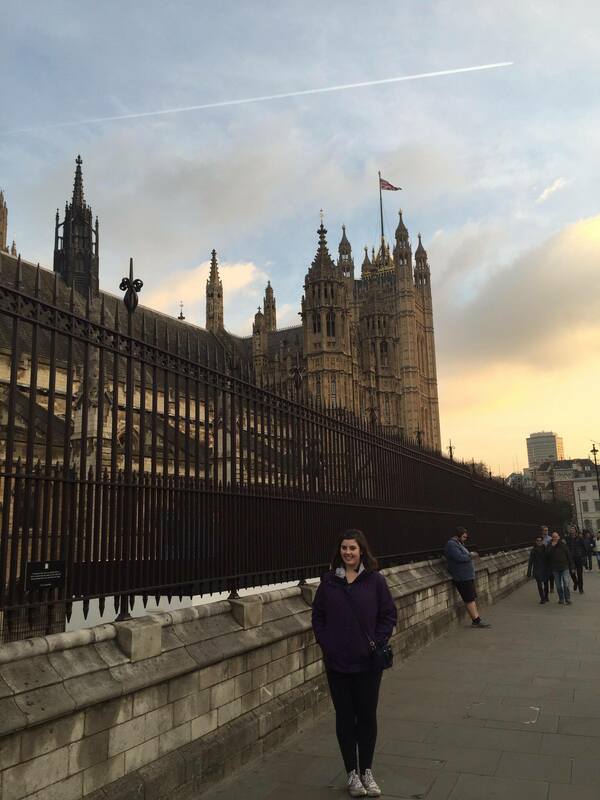 My phone chose the wrong time to die, so I had my friend take a picture of me outside Westminster Abbey. Still one of the most striking pieces of architecture I’ve ever seen! 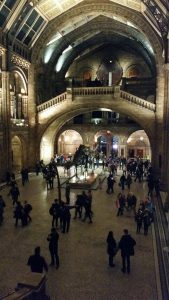 We hit up the Natural History museum (briefly) – free entry – and I hadn’t realized how cool the main room is. Really echoey, full of people, kind of Hogwarts-y somehow … but the staircases don’t move. As the sun was setting, we walked down the Shard … it was beautiful, but I can’t see myself ever living in London. It’s like New York, but somehow a little less friendly with just as much bustle. My flatmate, however, didn’t want to leave and is certain that she will end up living there one day. When she makes it big, I will be paying her a visit! Harrods at Christmastime is just as magical as I imagined – the lights outside are beautiful, and ‘Christmasland’ inside makes me wish Christmas could last all year. 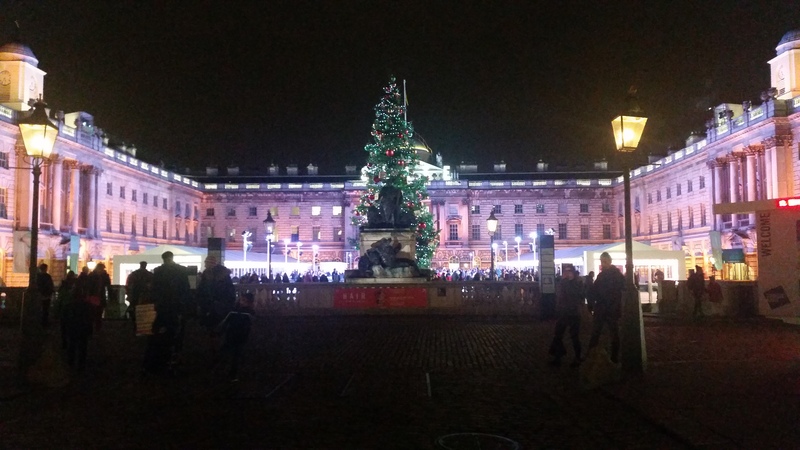 The streets of London were filled with decorations. These angels’ wings lit up and, paired with the chilly air outside and the general holiday feeling, it made for a festive time! Outdoor skating was ridiculously expensive, or we’d have gone for it – but the view was still gorgeous. 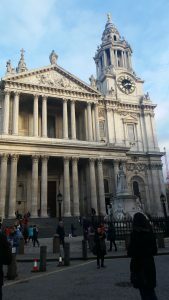 On Sunday we went to St. Paul’s and stepped inside briefly – the bells were ringing outside, which was another one of those out-of-body travel experiences. You’re not supposed to take pictures inside, so I didn’t bother trying to be sneaky but instead put my phone away and appreciated the height of the ceilings and incredibly beautiful aesthetic of the church’s interior. 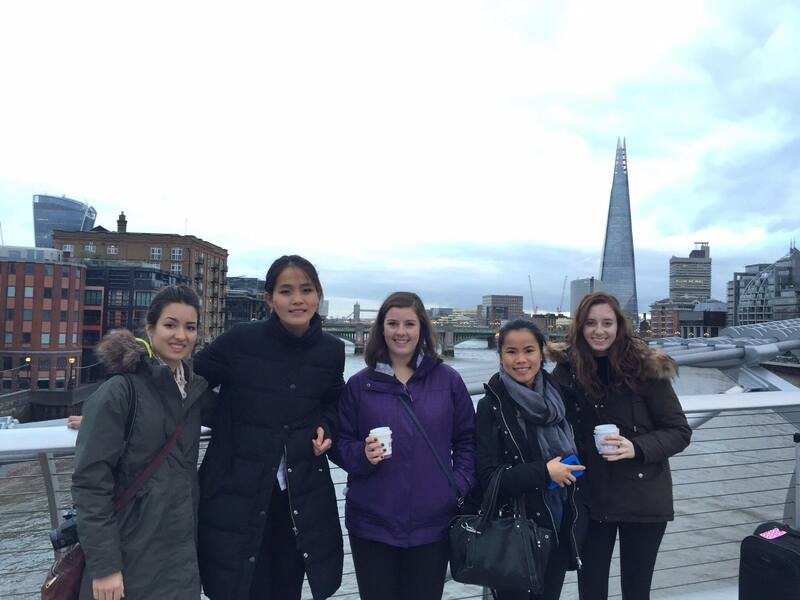 We finally got someone else to take our picture on the Millennium Bridge. Note how tired we all look – but these girls make great travel companions and I will miss them dearly. 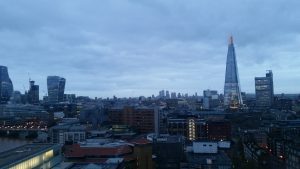 The view of the Shard (and London in general) from the 10th floor viewing platform at the Tate Modern. 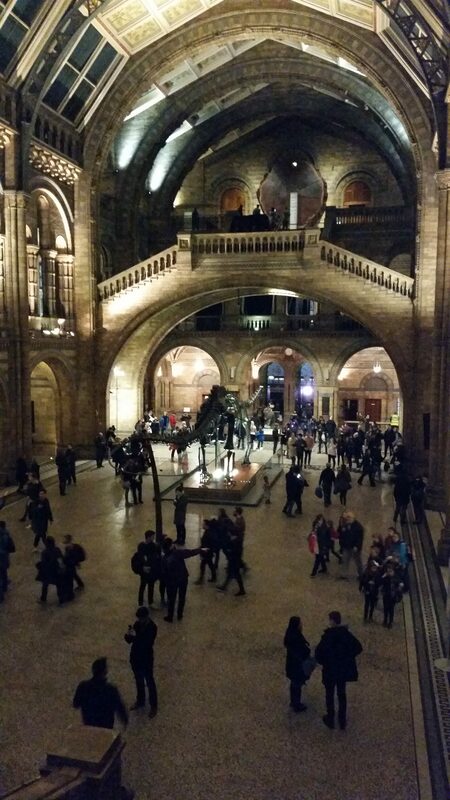 The museum itself was a little odd, but entry is free and the view was incredible. It’s also hitting me that I really only have three weeks left here … and they’re going to be mostly consumed by studying, stressing, and eating in a vicious cycle that (hopefully) will also include a little bit of sleep. Last night I got back from a whirlwind weekend in Paris – I met up with my friend Liz, who I’ve known since high school (or, I suppose, since fifth grade – but we didn’t become good friends until a few years later). 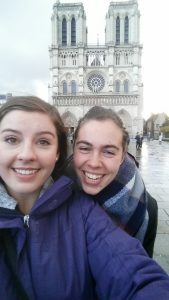 She’s doing a co-op term in Germany, so we decided to meet in the middle for 36 overlapping hours in one of my favourite cities! 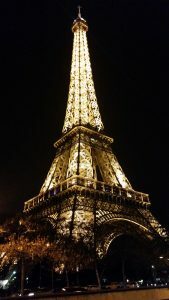 I should mention that I have been to Paris before; I actually went twice with my family, the summers I was 13 and 14. 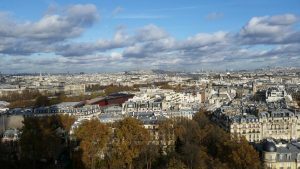 Each time, we were there for a few weeks and stayed in a rented apartment, so we had time to properly explore many of the arrondissements (neighbourhoods) and wander around the streets. But I’ve never been as an adult, and somehow 14 feels like eons ago! 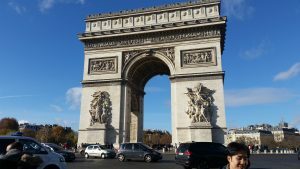 This time, Liz and I essentially did the ‘express Paris tour’ – on Saturday, we walked what turned out to be 50,000 steps. Back in the hotel room, she asked if my phone’s step counter knew how many kilometres we’d walked. It did – 43 kilometres and apparently about 2700 calories burned (which helped make up for all the bread products we consumed!!). Rather than waxing poetic about how much I love Paris, I will let the photos of this stunning city speak for themselves! 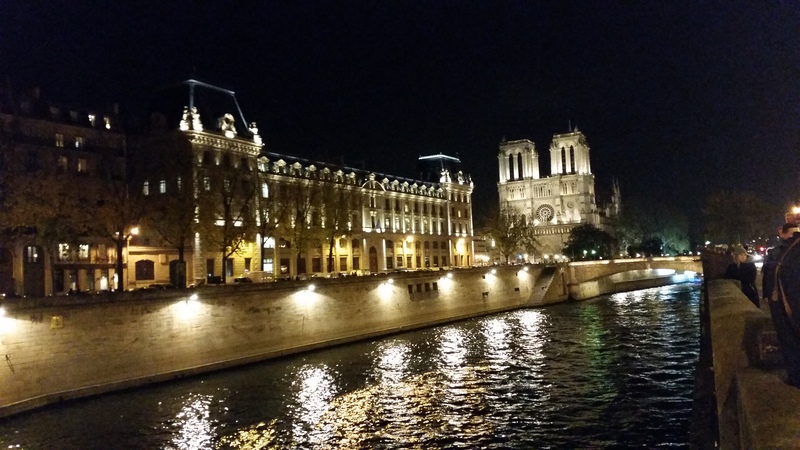 When I stepped out of the train station, I immediately saw Notre Dame – lit up – across the Seine. The sheer beauty of it almost brought a tear to my eye, and I remembered straight away why I’d fallen in love with this city the first time. On Saturday morning, after an amazing (free!) hotel breakfast of assorted breads, including some of the flakiest, butteriest croissants I’ve had in a long time, we went to the Louvre – and beat most of the tourists. 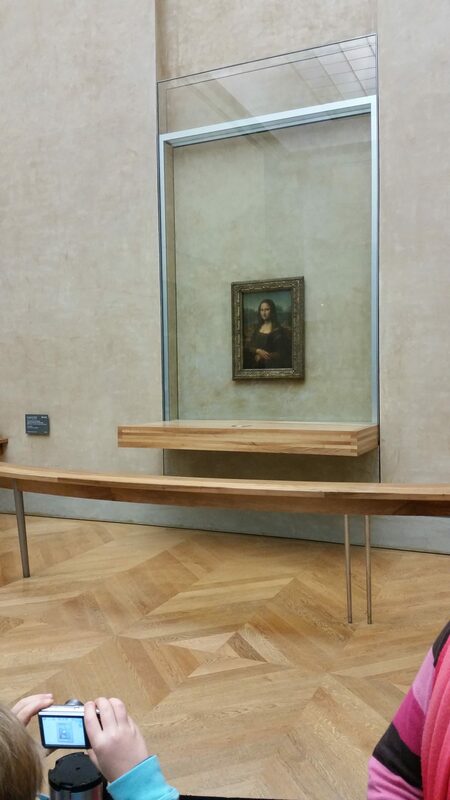 Naturally, Mona Lisa (or La Joconde, as she’s known en Français) still drew a crowd, but we got a pretty clear view. 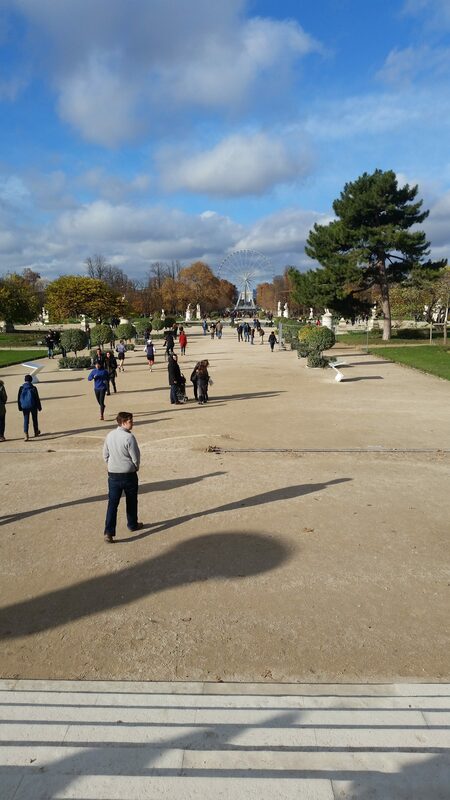 After the Louvre, we walked through the Tuileries and up the Champs-Élysées (through a Christmas market!). The weather was stunning and we kept remarking how lucky we were, then hoping we hadn’t jinxed it. As it turned out, it rained on and off on Sunday, so we probably did jinx it. Oops. The Arc de Triomphe is potentially my favourite piece of French architecture. It’s just so vast, with intricate carvings on every side, and it’s hard to imagine it being built by people. The 12-way intersection around it looks like a clock from above, and you have to cross the street via an underpass because it is constantly filled with cars. I would not like to be behind the wheel in this city (although, unlike the UK, they drive on the right side of the street in France!). We made our way along one of the 12 streets to the Eiffel Tower (Tour d’Eiffel) and took gazillions of pictures. We walked up three hundred and something stairs to the first level and I pretty much took a picture in every direction (since you can walk all the way around the balcony). I have actually been all the way up before, but neither of us particularly wanted to brave the heights and we felt like it wouldn’t be the best use of our time, so the first-platform view had to suffice. After the Eiffel Tower, we got pastries (I recommended réligieuses, which are essentially big iced cream puffs with little iced cream puffs on top). 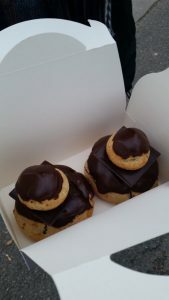 These ones had chocolate cream inside as well as chocolate glaze on top – we ate them as we walked through Montparnasse Cemetery, where Simone de Beauvoir and Jean-Paul Sartre are buried (among other famous figures). 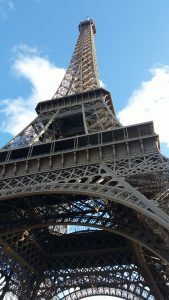 We spent much of the early evening wandering around our neighbourhood, walking our way back over to the Eiffel Tower, and got an amazingly priced dinner on the way there – it was 10 euros for a massive plate of lettuce and tomato salad, lentils, potatoes, green beans, and beets. Add that to 3 euros for fresh goat cheese (which we ate with the free baguette that accompanies every meal) and a couple of glasses of white wine, and we were satisfied. 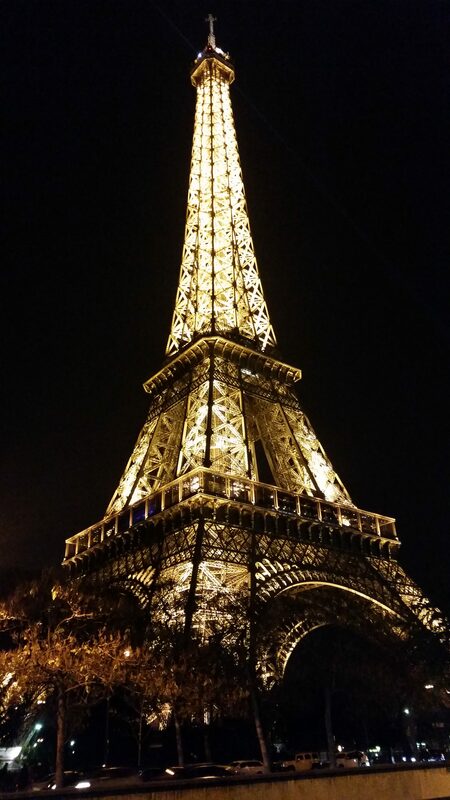 The Eiffel Tower at night is stunning – it lights up for five minutes every hour on the hour between 9 PM and 2 AM (I think? 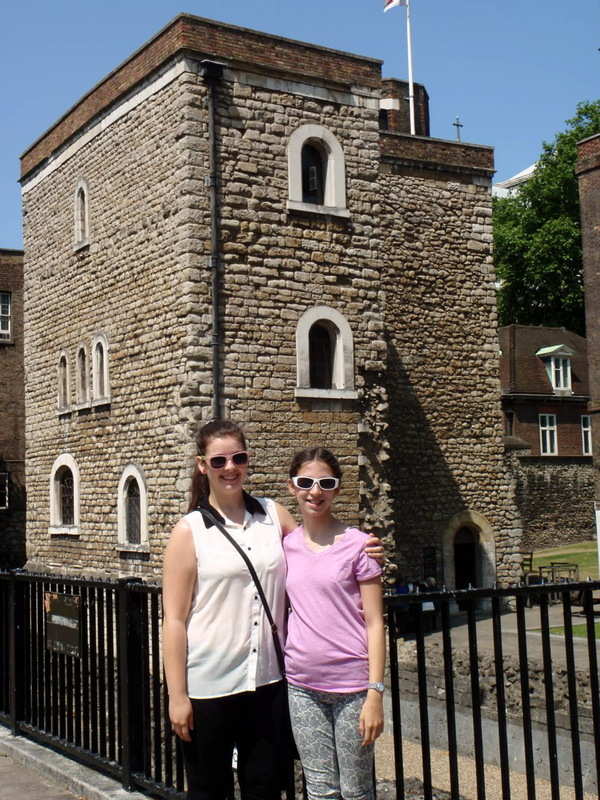 ), and we kept wondering what it would be like to be up the tower when it’s lighting up. 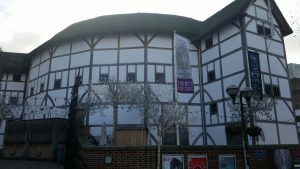 It is an incredibly striking sight, and although this photo does not feature the lights – they’re difficult to capture properly – rest assured that they are magical. 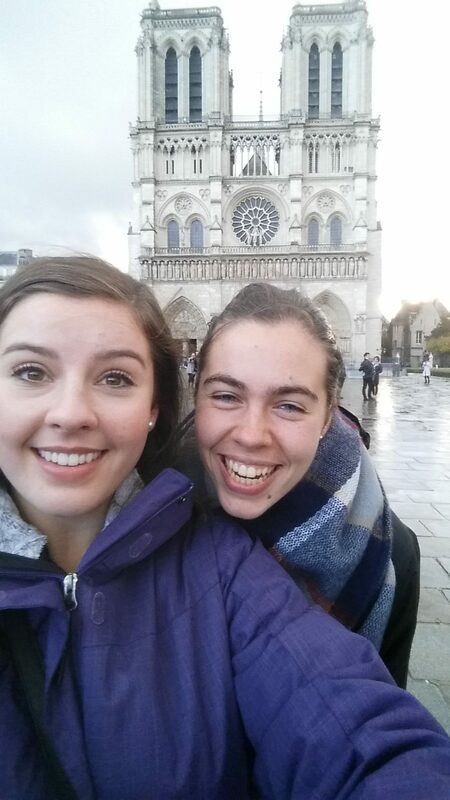 On Sunday morning, we ate more bread products … and then went back to Notre Dame for a surprisingly tourist-free experience. Unfortunately, this means I couldn’t caption this shot “In the tourist jam / Round the Notre Dame,” but anyone who knows me already knows that I love ABBA and Mamma Mia, so missing out on the cheesy pun just this once was okay. 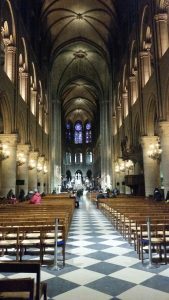 Because we made the incredibly sensible decision to go to Notre Dame first thing in the morning (so got there just after 9 AM), we managed to get inside with zero line and heard part of a sung service in French. 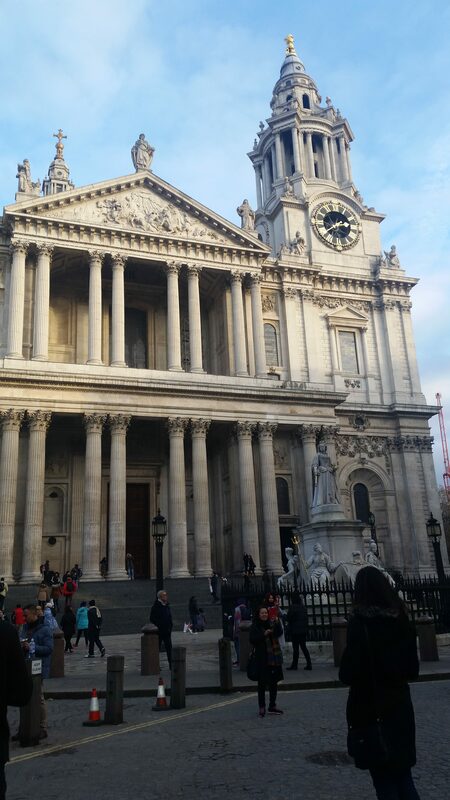 The interior of the church is stunning and the music was ethereal – what an experience! After a 10 AM ice cream from Berthillon (renowned for their crème glacée!) 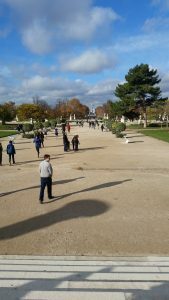 and a pleasant, peaceful wander through the Jardin de Luxembourg, I said goodbye to Liz. She was catching a noon train back to Germany and my flight didn’t leave until 8:30 PM, so I decided to wander along the Seine to the Musée d’Orsay on my own. 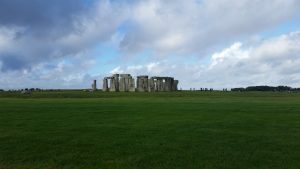 I haven’t done much solo travelling, and although I missed the company, it was oddly freeing to be alone in an unfamiliar city, just exploring. 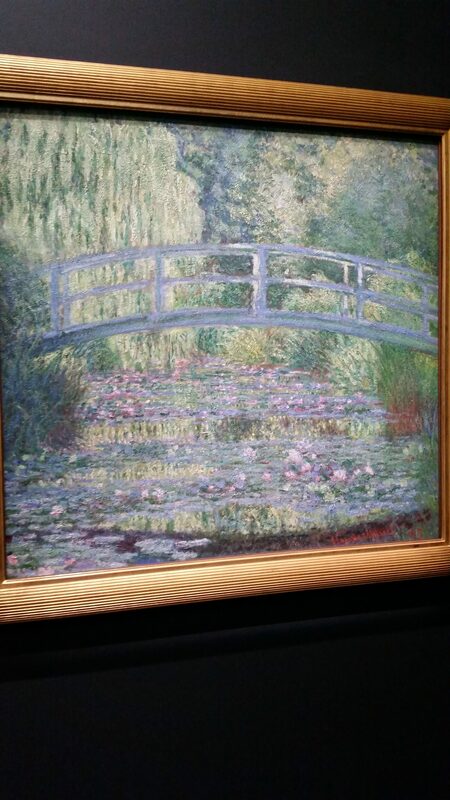 The Musée d’Orsay has an extensive Monet collection, and this is one of my favourites. I love his style of painting and the colours he uses are so soothing … it’s funny that after 2 years working at an art studio, the way I look at art and think about technique has totally changed. I’d say I have a slightly more practiced eye, although obviously not as refined as someone who’s been to art school! 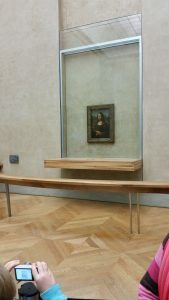 It’s certainly given me more appreciation for art and I am definitely a big fan of Impressionism as a movement. 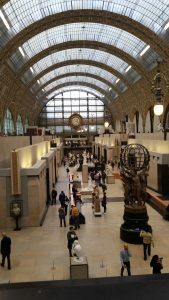 The inside of the Musée d’Orsay is beautiful – it used to be a train station, so it’s got a giant clock on one wall and a glass ceiling. 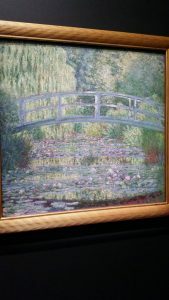 I spent a couple of hours trying to see everything – the floor of Impressionist works were probably my favourite, although there was a little wing of the first floor that was all pointillism, so that was cool as well. After this, I went and had a nice lunch on the Seine and took some final pictures, just wandering around the Quartier Latin (where our hotel was) for a little while. I indulged in a final crêpe and took in the city lights before making my way to the airport. If you have never been to Paris, definitely consider it – it’s a city full of culture and history, and although I have now been there three times, I can say with absolute certainty that I will be back, hopefully sooner rather than later. we have to work with what we get in life, use the time, don’t waste it. until you have to say goodbye. To everyone I’ve left in Vancouver, to everyone I know across the world, to everyone I’ve met in Edinburgh, thank you for helping shape my life. “Make new friends, but keep the old, one is silver and the other gold. A circle is round, it has no end, that’s how long I want to be your friend. It’s pretty simplistic, but kind of sums up the thoughts I’ve been having lately. The last week or so has been tough for me for a multitude of reasons, and often I find myself cursing the inconvenience of the 8-hour time difference. I’m trying to maintain friendships at home, but it’s difficult when, unlike my mom, my UBC/Vancouver friends can’t just Skype me at any convenient hour. Still, it’s nice to hear from friends at home and makes me feel like I’ll be welcomed back with open arms in a couple of months. 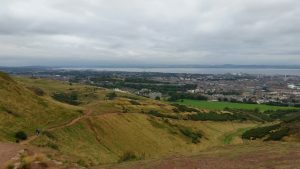 Despite my initial concern, I haven’t found it particularly difficult to make friends in Edinburgh – not only did I get lucky with my flatmates, but I have also had the opportunity to meet people through a cappella, yoga, women’s choir, various classes, and residence. Everyone I’ve met has been so nice and I’ve had many a conversation about travel, exchange, classes, and the differences between Scotland and Canada. I guess the moral of the story here is that I shouldn’t have been so worried about making friends, since everyone feels the same anxiety when starting university/living with roommates/going on exchange. I was led to believe that it would be easy, and it has been easier than expected – but unknown situations like this are always nerve-wracking! I will definitely be passing on the wisdom to others that it’s easier than it may appear. I must cut myself off before this becomes ramble-y! To all my friends and family, both new and old: you are so, so important to me and I appreciate all the support. Wish me luck as I continue to drown in readings while foolishly travelling every weekend! This is my first Thanksgiving spent without my family and without my mom’s homemade tofurkey, so I thought I’d take a minute to reflect. I set myself the challenge this year of making an entire Thanksgiving meal pretty much single-handedly, tofurkey and all. As a preceding note, sorry that this is reasonably long; I like words (see numbers 2 and 9). 1: Tofurkey itself. When I became vegetarian (in early 2005, at age 9) I was making a conscious decision based on re-reading Charlotte’s Web, a book I’d read many times before, but the book was really just the tipping point after months of feeling guilty and conflicted. I love discovering new vegetarian restaurants or recipes, and these days I don’t find myself missing meat at all. 2: My degree program. This is pretty cliché of me to say, but there’s honestly nothing else I’d rather be studying, and the friends I’ve made because of my choice aren’t too bad either. Of course, it comes with the added bonus of never being able to read a book for pleasure without analyzing its use of language at least a little bit, not that that’s a terrible thing. 3: My flatmates here in Edinburgh. I was worried that we wouldn’t get along, but I needn’t have stressed myself out over it; they are three lovely gems and I will miss them all dearly when I leave just before Christmas. 4: Yoga. When I have my mat on my back, fully decked out in Lululemon, I might as well have a giant light-up sign saying “VANCOUVER” over my head, but I wouldn’t have it any other way. I wasn’t always like this – in fact, I disliked yoga pretty strongly for years because I felt like it wasn’t giving me a good workout and was too much about breathing. When I discovered hot yoga (and later, vinyasa), all that went out the window – so I ought to be thanking Emily as well for helping me rediscover something that I now credit for keeping me sane! 5: Parents who support me in everything I do. In high school, it was more about driving me around and helping with homework, but now that I’ve moved out and learned to be (mostly) a grown up, they’re there for support, advice, university tips, proofreading, and free food, plus sometimes they let me borrow the car. Thanks, Mum and Dad. 6: My sister. I could wax poetic about this kid, but seriously, she is the best thing that’s ever happened to me. Being in Edinburgh, the city of her birth, reminds me of what it felt like to wait for her, sing to her when she was still in utero, think of hundreds of names for her, secretly hope that she would be a sister and not a brother. I’m thankful for her humour, her sensibility, and the bond we share. 7: My voice – I may not be a Broadway-level superstar, but being a singer has taken me so many places and helped me meet so many great people that I’m glad I stuck with it for so many years, and especially glad that I came off a year ‘on hiatus’ and hit the ground running again this year! 8: Girl Guides – at home, being a Brown Owl is one of the things I’m most proud of, and I’m so glad I managed to find a unit to volunteer with here in Scotland. There’s something really rewarding about passing on years of Girl Guide knowledge and life knowledge to kids who are still at an impressionable age, and I love being exposed to the fresh, open mind of 7, 8, and 9 year olds; once you’ve passed that age, there’s no way to go back and think like that again!! 9: Books! This is a very ‘English major’ thing to say, but the English language is fascinating and words are such an amazing tool. 10: My family here in Scotland – they picked me up from the airport, housed me for a week, then drove me back to Edinburgh, helped me set up a phone, and have been keeping in touch via text to make sure I’m okay. It’s nice to know there are people on this side of the world who are looking out for me! 11: Cheap produce. This one is a little bit simple, but honestly, the amount of kale I’ve eaten (69p for a bag!) is just absurd. Other great things include tomatoes, apples, peppers, and bananas, and a lot of stuff here is local, so somewhat more sustainable. Also, potatoes. 12: The ease of vegetarianism in the UK – you’d think that in a culture built on ‘meat and potatoes,’ it would be harder to be vegetarian, but in reality things are much simpler than I expected; everything is labelled “suitable for vegetarians” and there’s a big green V on all the cheeses/cheese-containing products that don’t have rennet in them. Canada, take notes! Why don’t we have this?! 13: The weather here so far; I realize that soon it’ll start raining and never stop, but the month I’ve been here has been sunny and warm with only a few insanely windy days. 14: The general hospitality I’ve experienced – everyone here has been so nice and understanding, and I like getting asked where I’m from, answering ‘Vancouver,’ and having people actually know where that is! 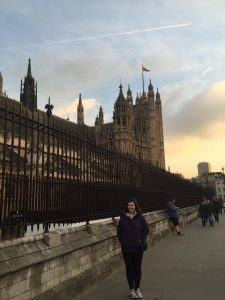 It’s kind of a novelty to not be a local for once – although often I think I’m assumed to be American because of my fairly neutral ‘North American’ accent. 15: Irn Bru. How will I ever survive without it when I go back home?! 16: Solitude – as much as I love being social, sometimes it’s nice to retreat into my room or take a walk and explore by myself. It’s not quite the same to study in the library, alone but surrounded by others; it works better when I actually feel like I am the only person present in a particular moment. 17: Music; when people ask me what kind of music I like, I tell them it’s a combination of top-40 (especially feel-good bubblegum pop, anything with a cool tune or lyrics that could be a poem), musical theatre soundtracks (Wicked, Grease, the Book of Mormon, Avenue Q, Mamma Mia, Les Mis, among others), and older stuff (‘60s and ‘70s, the Beatles, ABBA, Queen), as well as some lesser known artists. Bonus points if I’ve seen them live and loved it. 18: Romantic comedies. The cheesier, the better. 20: Travel – I’m trying to visit as many European destinations as I can while over here, and so far I’ve booked trips to Bath, the Isle of Skye, back to Hawick (where my dad is from), Paris, and London; we’re also hoping to make it to Dublin and possibly Spain! I’ve been bitten by the travel bug! Last week was the first week of classes, and wow do I ever feel lost. In first year, I had the advantage of being surrounded by other first years, which was amazing in the sense that none of us knew what we were doing. But here, I’m taking upper year classes hoping that they’ll transfer back at UBC, and everyone else in those classes has been together in a streamlined program for several years. More concisely, it’s disorienting to realize that three years of learning about a university system helps me only a little here. That’s not to say that I dislike the differences – some of the aspects of studying here make more sense than the way things are at UBC, and others leave me baffled. For instance, it’s perfectly normal for a course to have only one lecture a week, so there are fewer contact hours. On one hand, it’s nice to be able to set my own schedule, but on the other hand, I am a terrible procrastinator, so it’s daunting to have to monitor my own time and do my own readings, etcetera. The other major difference is that here, third year English classes are lectures with 150 people in a lecture theatre – not that this is less beneficial, but for someone like me who doesn’t mind actually speaking up in class, it’s not ideal; I far prefer ‘seminar-style’ classes where one can enter into a discourse with both the lecturer and fellow students. 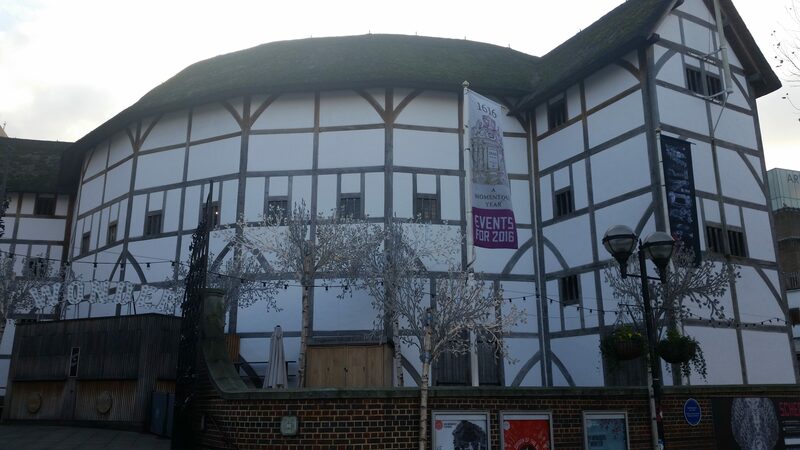 One amazing thing about studying here is that English Literature is a popular subject with classes that are actually so full I struggled to get into them as a visiting student. It’s different to be in a bigger program – at home, English Honours is not the largest of departments, which is both a blessing and a curse. Upcoming: my first Canadian Thanksgiving away from my family (I am going to try to make tofurkey for my roommates, but it will not be as good as my mum’s. Sorry, Mum! ), hopefully some travel, and NaNoWriMo (National Novel Writing Month) prep! I will be attempting to hit 50,000 words again this November, even though the timing for a university student is less than ideal, and even though my high school friend Liz and I will be meeting for a weekend in Paris in November. Wish me luck. Also, the culture shock has been a fun experience – I’ve started to call my roommates ‘flatmates,’ and everyone here says ‘queue’ rather than ‘line.’ I’m getting the hang of the money, but still feel a bit touristy when I peer into my wallet and can’t figure out which coin is which because they’re all the wrong size compared to at home. Cars can park on either side of the street here, so quite often I’ll see two cars parked nose-to-nose, or rear-to-rear. I’m pretty sure that would get you a ticket most places back home! I miss driving a little bit, but not enough to try and learn to drive a manual on the wrong side of the street! It must be said, though, that as a Scot (also a Scott) I fit right in when I pronounce ‘tomato’ the way I grew up pronouncing it – toe-mah-toe rather than toe-may-toe. This got long – once again, merci beaucoup for making it to the end! Expect more ramblings soon! PPS: I also miss the absence of pennies. I complained bitterly about it at first, but it sure makes for a lighter wallet! But, alas, I don’t miss the plastic notes. Oh, Canada.